TORONTO - Spin Master Corp. (TOY.TO) reported higher-than-expected second-quarter revenue and net income despite facing market challenges from inventory liquidations at Toys “R” Us stores in the United States and United Kingdom. 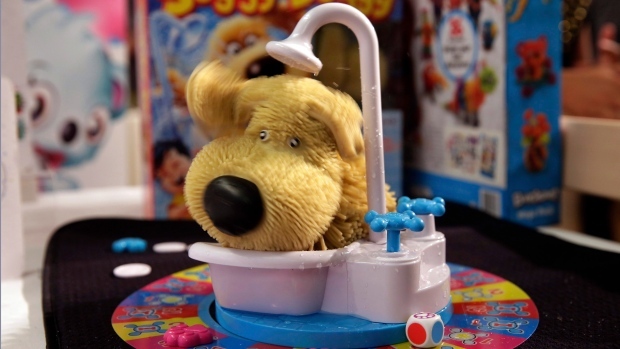 The Toronto-based toy maker, which uses U.S. currency in its financial reports, says it had net income of $26.9 million or 26 cents per share in the three months ended June 30, compared with $22.1 million, or 22 cents a year earlier. Revenue came in at $312 million, an increase of 12.6 per cent from $277 million in the second quarter of 2017. Analysts had forecast net income of $17.5 million or 16 cents per share on revenue of $276 million, according to Thomson Reuters Eikon. CEO Ben Gadbois said in a statement the strong performance resulted from steady consumer demand for the company's brands, which include Hatchimals and Paw Patrol, and its entertainment franchises. Spin Master reported sales of activities, fun furniture and games and puzzles rose 49 per cent to $86 million in the second quarter compared to the same period of 2017, while remote control and interactive characters fell 19 per cent to $68 million. Spin Master's net income in the first quarter was $8.7 million, or nine cents per share, thanks in part to a $15.2-million bad debt expense related to the Toys “R” Us store closings.